Kitchen is an essential part of every house and a place where a lot of time is spent. It should be designed for convenience and functionality. Apart from this, more and more people are spending money to ensure that it is high-class, stylish and up-to-date. A modular kitchen combines all these aspects. Choosing the right modern kitchen design is certainly not an easy task. There has been an emerging trend of Modular kitchens nowadays because of its sleek and durable design. It has changed the concept of kitchens and uplifted it to another level of stylish decor. They come in a variety of styles, designs, materials and with many more features. Having one of the modern kitchen designs provides enhanced workspace, increased performance, freedom of organization and amazing inbuilt features. Modular kitchen designs are highly appealing and functional. They offer a more organized, systematic and clutter-free look as compared to open kitchens. So, if you are considering to enhance or refurbish your kitchen area, then you need to get familiarized with these simple rules provided below before you decide it. This can help you as guide to modular kitchen design. The first and foremost thing to decide is the layout of your kitchen. Understand your needs & necessity then design your kitchen accordingly . There are various layouts of the kitchen such as parallel, straight, L shaped, and U shaped, which maybe or may not include an island with it. The criteria for layouts are based on accessibility and kitchen space. The layouts all listed above have certain sets of advantages & disadvantages, so be attentive to your needs before deciding the layout option. Once you have a basic layout in place, figure out the electrical points for chimney, oven, microwave and other electrical appliances. You will also have to identify the spot for your sink because the plumbing will be according to its location. Also Read: The Secrets of Kitchen Layouts: Types of Counter Arrangements! The second step is to decide on the work triangle. It determines the location of stove, sink & refrigerator. These three aspects of the kitchen should be place in such a way that the user can efficiently work with ease. The kitchen work triangle is decided as per the layout of the kitchen. The kind of material you select affects the cost of building the kitchen. Choosing average quality plywood will naturally lower the cost compared with marble or granite. However, do not choose a material based only on price. Consider various factors such as effect of heat, water, humidity, friction and load on the material. For example, MDF cannot bear much weight, while white marble can turn yellowish over a period of time. Once the above listed points, kitchen layout and work triangle are decided, you should be prepared to decide on the storage and its quantity. This will allow you to analyze the different storage cabinet options & accessories that will enhance the look of your kitchen as well as offer comfort and ease of task. Remember not to clutter the kitchen. Rather, classify your storage areas as per your needs. Many a times, kitchen corners are simply ignored, as they cannot fit in the normal cabinets. You can make use of those corners by preferring open shelves. Overhead storage cabinets are also a nice way to create extra space. You can also have pull-out cabinets installed from floor to ceiling. This combination of open & closed storage options will make for a functional kitchen hence increasing the storage area for smaller day-to-day objects. Ventilation is the major deal in kitchen. Never neglect this thing regardless of the size and type of kitchen, particularly in Indian homes. 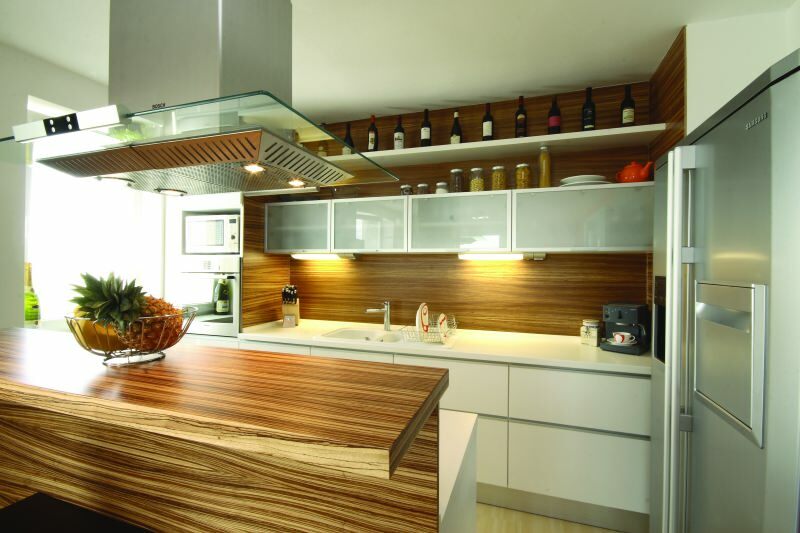 A good kitchen design is determined by good ventilation and various other factors. Highly expensive ventilators can certainly guarantee freshness in the kitchen only when the vent system is done sufficiently. So, make sure they are provided properly. Also, ensure that you provide sufficient space for windows & doors for cross ventilation. Also Read: Tips to Ensure the Good Ventilation in Home! Theme of the kitchen area is important part as it decides the colour of the furniture and walls and also the lighting factor to be incorporated in the kitchen. The materials to be used other than Modular kitchen as for countertop materials, sink appliances and seating chairs and stools also depends upon the theme to be used. The material property and type, scale of application in terms of quantity also depends upon it. Colours are highly important, which influences the overall look of any interior space, whether it may be living room or bedroom, kitchen or dining room. A happy, cheerful, classy, elegant or trendy kitchen is needed to enjoy the culinary art. To make that happen, perfect combination of colour palette must be selected as it decides the mood of the activity in that area or here specifically,kitchen. A colour is not only used to define the wall, it is also a necessary factor for cabinets, countertops, island, flooring, etc. Lighting is of dominant priority in any space for interior designing. Proper and sufficient lighting is must for kitchen décor as well as other spaces in the houses or building. It should be functional and artistically pleasing. Choose properly from a lighting type & style that matches with the kitchen theme which not only adds beauty but also functionality to the overall appearance. Light intensity plays an important role in the mood of the work area so keep that point also in consideration. It is the final factor which decides the look & feel of your kitchen. The most common electrical appliances in modular kitchens are ovens with microwave and heating features. You can also install grills with a combination of stove top and grill oven. While choosing appliances, always install that fit your needs instead of selecting the ones you see in the showroom. For example, the cost of an electric chimney can range averagely from Rs. 8,000 to a little over Rs. 1 lakh. It does not make sense for you to select for the high-end one if your kitchen does not have the desired, built-in technology to use the chimney efficiently. This was the guide to modular kitchen design which will allow you to design it or any other conventional kitchen in a systematic manner. Always seek good professional advice in house related matters where the professionals have the knowledge about that aspects of your problem. Thinking not to invest money on good designers for their advice and helps may save your money for shorter spans of time, but in the long run if the thing is not according with technical aspect, it may prove costly then after. Create the space so that it helps you to explore your culinary talent and makes you want to cook by creating a desired mood for it. Hoping for awesome and functional kitchen!!!! Good luck. Previous PostPrevious What are the Pros and Cons of Masonry in Construction? Next PostNext Kitchen Chimney – All you Need to Know!